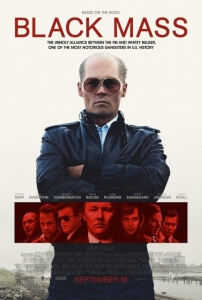 Just when it looked like Johnny Depp was permanently stuck in a funk of churning out eccentric comedy characters, trying in vain to recapture the spirit of his now-infamous portrayal of Captain Jack Sparrow, along comes a character like James “Whitey” Bulger to make us forget that Mortdecai even existed. The absolute highlight of Black Mass, the third film by director Scott Cooper (Crazy Heart, Out of the Furnace), is indeed Depp’s performance as the notorious Boston gangster. The character is already written to be an intimidating presence by writers Jez Butterworth and Mark Mallouk, but the actor knocks it up a notch by making him legitimately frightening company to be around, without even raising his voice; a dinner scene showcased in the film’s early trailers is a perfect example of this, and should Depp be in for some awards contention this upcoming season – and early indicators suggest he has a chance – then we can easily see this scene being the clip played as his name is read out. Some effective make-up work also helps to bring out the scariness in such a ruthless and uncompromisingly rough character, but at the film’s pure centre is Depp going to town with what has to be his best performance in years. The rest of the film, on the other hand? Eh. Its biggest problem is that it’s just too convoluted and disjointed to work as a solid narrative. There are dozens of characters that come and go, most of them being played by some pretty established names from Kevin Bacon to Dakota Johnson to Peter Sarsgaard etc, but the script can’t seem to pick which ones it should focus on and just has the majority of them simply disappear when their big scenes are done and dusted. The film starts out with an interrogation framing device with Jesse Plemons’ young gangster Kevin Weeks, and for a short while it looks like we’ll be following this kid, not dissimilar to the set-up for Goodfellas; but then the focus shifts to FBI agent and Bulger’s childhood friend John Connelly (Joel Edgerton) as he encourages the gangster to become an informant for him, and just when we think we’re finally settled the focus shifts again to guilt-ridden FBI agent John Morris (David Harbour), then Bulger’s senator brother Billy (Benedict Cumberbatch), then Connolly’s concerned and scared wife Marianne (Julianne Nicholson), and so on. It’s a shame, because there are a lot of good actors being brought in to fill in the ensemble, and the majority of them do give strong performances under Depp’s shadow, but the script that they’re all working with is already crammed with such detail that it’s near impossible for most of them to leave a lasting impression. A lot of the information about what’s happening within this little crime syndicate goes by so fast and without much time to breathe that it can also be hard to pick up on what exactly is going on. All we can seem to gather from watching it is the most basic of information, from how Bulger’s criminal empire was able to expand thanks to Connolly’s growingly-corrupt nature to how the loss of certain figures in his life, including a young son who suddenly develops Reye syndrome, caused him to shed the last few traces of his humanity; this is the kind of film you have to look up on its Wikipedia page to get more of an understanding as to what went down. The script may be all over the place, but Cooper still manages to direct a fine-looking film out of it, bringing some great performances out of his cast, especially Depp, and keeping the dark tone consistent throughout the entire running time. He knows exactly what kind of film he’s making, and he delivers a good-enough product that is certainly flawed, thanks to its messy script, but has an equal amount of merits to keep it from being a drag or a bore. Black Mass showcases Johnny Depp in easily his strongest performance in years, but despite strong direction by Scott Cooper and a talented supporting cast its script is too convoluted and disjointed to work as a whole.